Jangchub Choeling Nunnery was founded in 1987 in Mundgod, South India. One of the monastery's older living quarters of the monastery is in danger of collapse. The building - which was construted with a too-weak foundation - only has a life expectancy of five to ten years or less, in case of ground motions. Therefore, a new building should be built as soon as possible. The nuns' rooms serve as dorms and study rooms and are used by students and teachers alike. They are used for learning as well as preparing lessons. The monastery has an administration elected by the nuns, which independently organizes tasks such as housing and care. Extensive degree programs are offered with a focus on in-depth studies of the Vinaya texts. The study of Buddhist philosophy spans at least 17 years and can be completed with a Geshema degree (equivalent to a doctorate in philosophy). Eight Geshemas have emerged from the monastery, and another seven nuns are currently preparing for the exam. 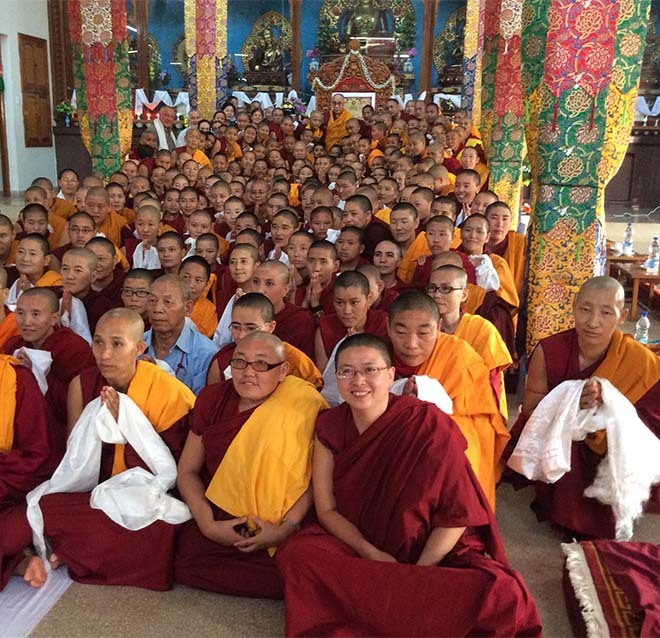 As part of the Tenzin Gyatso Science Scholars Program, two nuns of Jangchub Choeling Nunnery are currently studying at Emory University, a private university in Atlanta, Georgia (USA). In addition to the abbot and a disciplinarian, Ven. Geshema Ngawang Chökyi was voted chief nun. She enjoys the confidence of the nuns and takes the rank of deputy abbess. She currently is in a Tantra training in Dharamsala. The long-term goal is to transfer the leadership of the monastery to an abbess. Transferring a leading position to a woman is a political issue in the Tibetan community, which is why the Dalai Lama's support is important. Jangchub Choeling Nunnery currently comprises 257 nuns, including students from Taiwan, Korea, China and the United States. The nunnery would like to welcome students from Europe, Germany respectively. They would be able to participate in the full training and graduate with the Geshema degree.